Ashley J George | AD-ventures of a Creative: Was that it? The weekend is over? 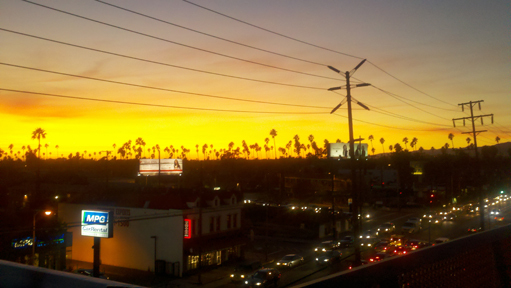 Sunset in Venice, CA overlooking Lincoln Blvd. just north of Washington. There is no way that the weekend is long enough. Especially when you have to work over the weekend. I feel like I accomplished a lot, though with that comes with a complete lack of sleep. I ate at Jerry's Deli . . . my best friend keeps taking me to these places that are not good. First it was Jollibee where I seriously thought I was going to vom. Then she takes me to Jerry's Deli for a $16.00 California Club sandwich which was really good, but then spoiled by horrific apple pie . . . wah wahh. I am also trying to grow a garden. My last name means "Farmer" after all . . . so I should be really good at growing things. Apparently you can't just plant seeds and have a plant in two days. So, Instead of a garden allowing me to have vegetables to make home made salsa . . . it is teaching me patience. Most of you that know me . . . it's going as well as you might imagine. Anyway . . . as you can see I lead an incredibly exciting life on the weekends . . .